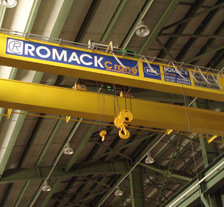 ROMACKcrane double girder cranes are available with a huge range of customer options in capacities up to 200 tonnes. Double girder cranes give a better height of lift in a given headroom as the hook travels between the beams. They are available in higher capacities than single girder and for heavy duty applications they can be supplied with open winch hoists. One simple advantage of the ROMACKcrane double girder design is the possibility to fit a walkway to the crane which gives maintenance access to many critical parts of the crane and often to overhead lighting etc.